Soy side effects come from its content of soy estrogen which causes health problems in both men and women. The side effects of soy are due to phytoestrogens which disturb the hormone balance of your body. The truth about soy and soy products is that they are not the healthy alternatives that many people think. Soy estrogen can cause many problems in a healthy body, and thus we need to separate fact from fiction when discussing soy’s alleged benefits. Soy is promoted as a healthy protein source because its protein is from a plant source and therefore healthier than protein from animal sources. It’s showing up in everything these days from margarine and vegetable oil to canned tuna and fast food. This makes it hard to avoid and keep track of how much soy you are consuming. They soy industry has promoted it as a healthy food, but the side effects of soy tell a different story. Soy also contains goitrogens which are substances that suppress the function of the thyroid gland by interfering with iodine uptake. Asians Eat it and They Are Healthy Aren’t They? Yes, Asians DO eat a good amount of soy BUT there is one important difference. The soy products they use are “fermented,” and the fermentation process destroys the harmful compounds (phytic acid) in soy that cause the problems! Keep in mind also that Asians eat soy in specific fermented soy products, whereas in the U.S. soy is increasingly being used in products without our awareness, so we consume a lot more soy than we know about. Is There Any Benefit To Eating Soy? Given what we know about soy estrogens, not to mention the problems caused by phytic acid the answer would be no. When you factor in the processing of soy, what you end up with is a food with no actual value for health. Many people are convinced that plant based diets are inherently healthy, and of course they are (for people that are genetically designed to be vegetarians). They often note that soy is the only complete protein from a plant source. The problem is that the processing of soy using heat denatures (destroys) the proteins leaving little real nutritional value to them. That combined with the phytic acid, phyto-estrogens, and other toxic compounds make soy side effects a nutritional nightmare. Everything that we know about the side effects of soy strongly suggest it should be avoided if you are interested in optimal health and longevity. 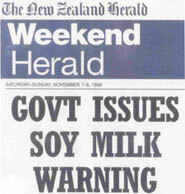 Check out this site on Soy Dangers for more information.